Funfetti Biscuits have a little sweetness and lots of sprinkles and a sugary glaze. Plus lots of flaky layers. They are perfect for a brunch or special occasion breakfast. This recipe is based off of one that was published in Taste of the South Magazine and inspired by Callie’s Charleston Biscuits. 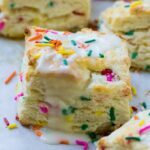 A combination of butter and cream cheese makes for a really fantastic tasting biscuit. The dough gets cut into fourths and stacked 4 times and patted down each time. This gives the biscuits lots of wonderful flaky layers. For the best southern biscuits, the flour you use is very important. You want a flour that has a low protein content like White Lily or Southern Biscuit. They are difficult to find outside of the south but can be ordered online. No need to use a biscuit cutter. Just cut the biscuits into squares with a knife. No waste and no re-rolling the dough. Plus no searching through the drawers for the biscuit cutter. Whisk together flour and sugar in a large bowl. Add the butter and cream cheese to the bowl and use a pastry cutter or 2 knives to cut them into the flour until the mixture is crumbly and there are no pieces larger than a pea. 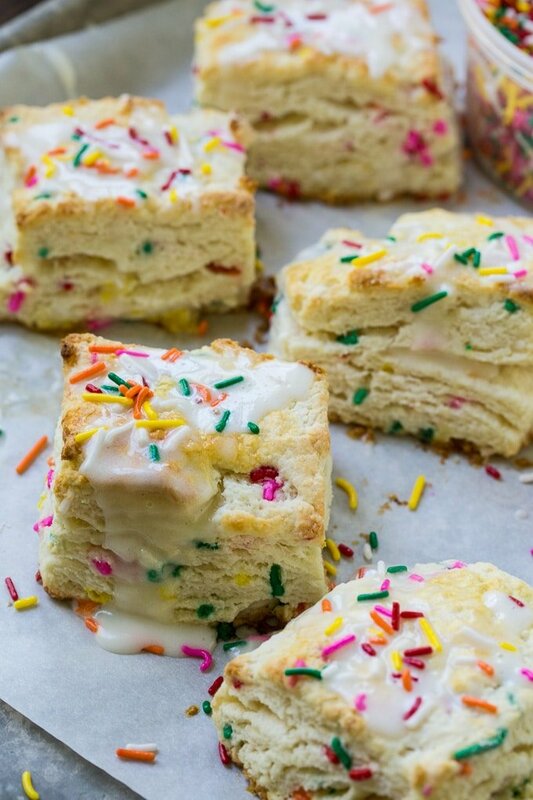 Stir in buttermilk and sprinkles until a shaggy dough forms. Turn dough out onto a lightly floured surface. For easy clean up, I lay a piece of parchment paper on the counter and lightly flour it. Pat dough into a rectangle and cut into 4 pieces. Stack the pieces and flatten them down until you have 1 piece of dough that is about 1-inch thick. Repeat this process, cutting into 4 pieces and stacking them, 3 more times. Pat or roll dough until 1-inch thick. Use a knife to cut into 2-inch squares. Place biscuits on prepared pan. Brush tops with egg. To make glaze, whisk together all ingredients except sprinkles. 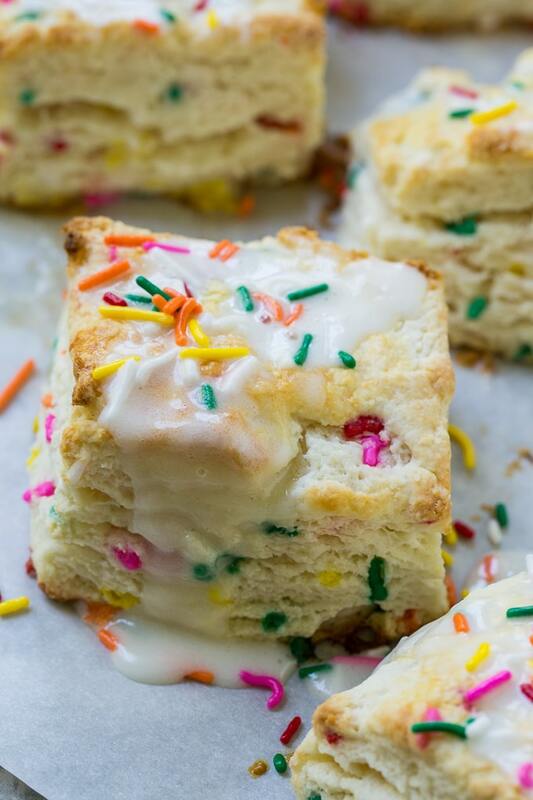 Drizzle on top of biscuits and sprinkle with extra sprinkles. For the self-rising flour, it is best to use either White Lilly or Southern Biscuit. The colder your ingredients, the better. I like to place the bowl I am going to use in the refrigerator about 10 minutes beforehand. I also stick the cubed butter and cream cheese in the freezer for 5 to 10 minutes. These look so delicious! And everything is just so festive with sprinkles. I’m thinking these would be a great vehicle for lemon curd as well!